Network Nazi: An original flash shooting game by Galaxy Graphics. Flash Games licensing. Underneath the Network Nazi theme, this game is a straigtforward shooter. 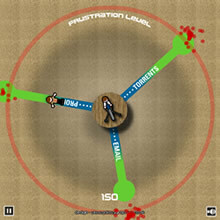 The player sits in the middle of the screen, turns and shoots whilst enemies approach the player from the edge of the play area. There are 20 levels of increasing difficulty and the possibilty to adapt this game into any number of variants - even to a retro style space shooter. This version "Network Nazi" is designed for it's viral properties due to the frustrating nature of many corporate IT departments - and all the net services they block. The player can gain some satisfaction by blasting all the IT guys as they approach his desk and attempt to cut internet services such as email, FTP, torrents and youtube - certainly something that many over-policed office workers will sympathize with. Looking for Network Nazi source code in actionscript? The source code for this Flash game is also available to buy from Galaxy Graphics. Click here to contact us about Network Nazi Source code.